This is photo of the American Media Building after it was attacked by Anthrax. In October 2001, after the 911 attacks, we were all working and there was a news report about someone local at American Media dying from Anthrax. The news at the time reports that Bob Stevens died from drinking water in the Carolina’s where he had been vacationing. The person that was saying this was the head of the Palm Beach County Health Department. I was driving down Okeechobee Blvd when I got the call to come home because someone died from Anthax. I knew this wasn’t true because I had been reading about Anthrax at the DOD website. After 911 we were all so hypervigilent. I think we never thought our lives would get back to normal. I did know this. You can’t get anthrax from drinking it in the water. We contacted Governor Jeb Bush and he contacted who ever the head public health doctor was. The pharmacy I worked at sold out of cipro instantly. We then sold out of doxycycline. So did everyone else. The entire area sold out of antibiotics. 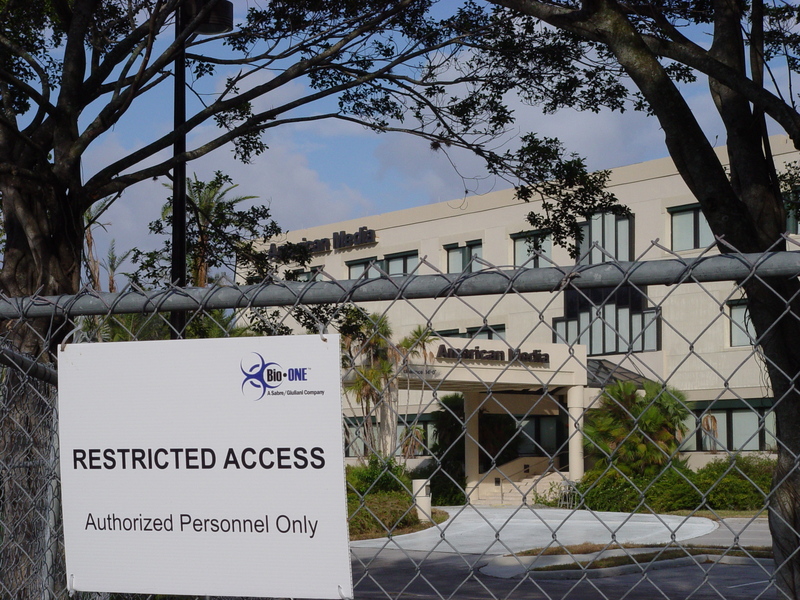 At the time Dr. Jean Malecki the head of the health department of palm beach county did not want to check for spores in the noses of other people that worked at American Media but the people who worked there insisted. I can’t remember how many but there were spores found in the noses of a few people. I may be wrong but I believe this was the first. I do not think they ever figured out who did this but they did think it was from someone who access to weaponized anthrax. As I did my research this morning I see a lot of history has been rewritten but I have to work so I’ll save that for another day. I can tell you this for sure. If you look closely at the photo the company name was Bio One. Bio One was owned by Rudy Giuliani. I guess it’s a smart move to benefit financially from the deaths of other people. So when I talk about how we have to continue to be vigilant and call out the news this a prime example. I will never forget how terrified I was. Not just because of the Anthrax but because of all the mistakes of the news media of the time. Remember this New’s Media. Report the news. Period. Otherwise it’s propaganda and scare tactics. This entry was posted in florida, history, throw back thurs and tagged anthrax, Bio One, boca raton, Dr. Jean Malecki, jeb bush. ← On the Snout: Florida bought and paid for.